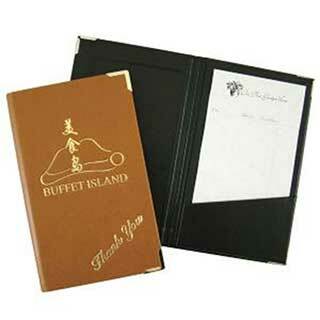 Bill presenters are used by hotels and catering establishments to present a guest or customer their food bill in a professional manner. Bill presenters are available in a wide range of sizes, fabrics, designs and colours. Bill presenters can be personalised with a company name and logo. We have a large range of bill presenters suitable for all establishments. All prices include a standard 'Thank You'. Heat embossed - Recommended. Foil Blocked in Gold or Silver. 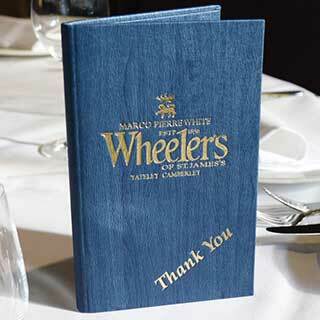 Manufactured using matt laminate paper to give a wipe clean surface that is ideal for foil blocking. Elegant modern cover designed to impress. Smooth wipe clean finish. Gold or silver corner protectors. Slim size 125mm wide x 200mm high. Colours available: Bronze, Burgundy, Dark Blue, Graphite, Light Blue, Pale Green, Purple, Red and Silver. 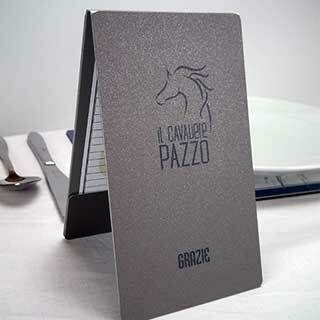 You can also personalise the covers in a printed metal plate among various other options. All prices include a standard 'Thank You'. This vibrantly printed metal receipts holder is available in three styles. While being sturdy and robust the metal can show scratches after use if not cared for. Each style comes in a choice of three colours - Silver, Gold or White and in a slim size. The metal holders can all be personalised by printing in full colour. Strong and robust (although scratching can occur if not cared for). Side opening pocket style is available in two sizes and features a bottom pocket to hold the bill in place. 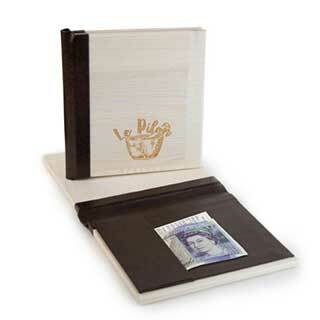 Flip up style also features a bottom pocket for bills, receipts & cards but utlises a stylish and easy top opening cover. Full Colour printing using your own design and colours. Minimum quantity of 10 - One off set up cost £35 for up to 90 sq cm subject to sight of artwork and per item cost of £4. Minimum quantity 10. MR.
Colours available; Black Ash, Blue Wood, Cherry, Dk Oak, Distressed Oak, Grey Wood, Lt Ash, Lt Oak, Mahogany, Walnut, White Wood, Whitewashed. Many spine colours available. Each of our stylish wood finishes (shades may vary) will give years of service and can be engraved with your own design. Open style bill presenters are ideal for restaurants. There are three easy to use styles to display bills, cards, notes and change. 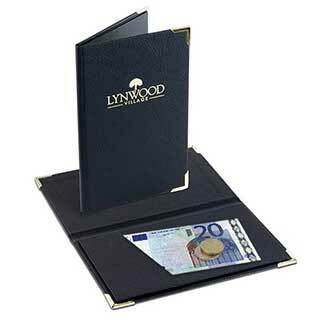 Our metal open bill holders are a simple and stylish way of presenting bills to customers. 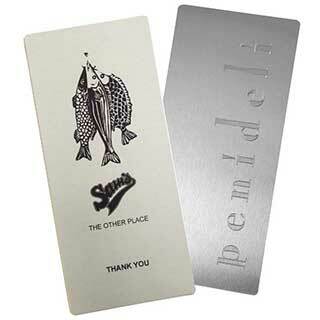 Available in a brushed silver finish they can be personalised with your own printed information or standard thank you. Our faux leather flip bill presenter in a textured finish has a magnetic holder tab to hold bills, notes or credit cards. Black or brown faux leather or a charcoal wood effect finish. 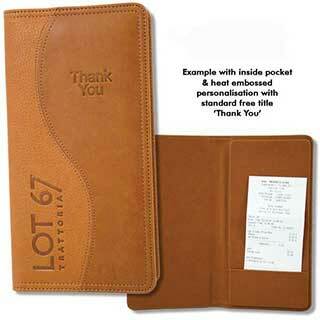 Can be personalised with your logo or heat embossed with 'Thank You'. The textured fabric bill presenter is supplied in a range of colours in a textured cloth. This unique fabric is water resistant with a deep grain making it stylish & versatile. Each restaurant bill presenter can be personalised with your own text or logo with either blocking or full colour metal plate. Optional gold or silver corner protectors. No charge per item for foil blocking. Your logo or text can be blocked. Foil Blocked in Gold or Silver. Heat embossed. Printed Metal Plate available in gold, silver or white. One off set up cost £35 for up to 90 sq cm subject to sight of artwork. Minimum quantity 10. M/N. Our padded swirl design biill presenters have the same elegant finish as our menu range and come in six colours combining a smooth and textured finish. 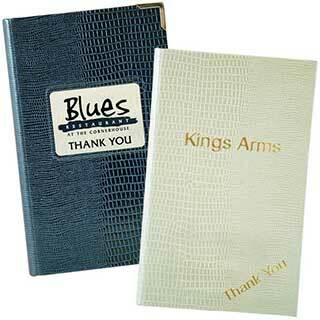 These sales slip bill presenters can be personalised with heat embossing or can be supplied plain. They also feature either an inside pocket or tray with magnetic tab making them ideal for holding bills, cards, notes or change. A soft feel padded cover. Range of 6 colours - Black, Blue, Dk Brown, Green, Grey, Tan. Pleated corners as standard. Optional metal corners (Extra £1.50 per bill presenter). Inside pocket. Inside tray with magnetic tab for holding bills/paper. No charge per item for heat embossing. All prices include standard title 'Thank You'. Your logo or text can be heat embossed - one off set up cost £35 for up to 90 sq cm subject to sight of artwork. Padded. This new range of bill presenters features a great range of wood effect colours and a material that is both soft to the touch and durable. Featuring a realistic wood grain texture each of these bill presenters can be customised in a variety of ways. Each restaurant bill presenter can be personalised with your own text or logo with either blocking or full colour metal plate. Stylish and water resistant. Optional gold or silver corner protectors. Wide range of wood textured colours including Charcoal, Grey, Mushroom, Dk Oak, Mink, Rosewood, Cherry Oak, Orange, Burgundy, Dk Blue, Dk Green, Royal Blue, Lt Blue and Yellow. All prices include a standard 'Thank You'. Maximum size of bill 105x185mm. The textured faux leather bill presenter is supplied in a range of traditional and contemporary colours in a soft faux leather. The textured cover has the look and feel of a luxurious leather and features a range of customisation options to make them your own. No charge per item for foil blocking or heat embossing. Soft imitation leather. Wide range of colours including Black, Green, Red, Sand, Blue, Lt Brown, Burgundy, Dk Brown. Optional gold or silver corner protectors. All prices include a standard 'Thank You'. Heat embossed - Recommended. Foil Blocked in Gold or Silver. Your logo or text can be foil blocked. Metal plate available in gold, silver or white printed in full colour. One off set up cost £35 for up to 90 sq cm subject to sight of artwork. Minimum quantity 10. K/N. The crocodile skin feel bill presenter features an interesting crocodile style texture in several striking colours. Each bill presenter can be supplied with a range of options including a printed metal plate on the cover or blocked personalisation. Bright textured cover. Wide range of colours includes Sand, Red, Plum, Pearl, Orange,Nightshade, Mystic and Blue. Personalised metal plate in gold, silver or white. Blocked logo in gold or silver. All prices include a standard 'Thank You'. Our padded wave design biill presenters have the same elegant finish as our menu range and come in six colours combining a smooth and textured finish. These sales slip bill presenters can be personalised with heat embossing or can be supplied plain. A soft feel padded cover. Range of 4 colours - Charcoal/Grey, Cherry/Rosewood, Blue/Dark Blue, Mushroom/Dark Oak. The interior is supplied in the darker shade. All prices include standard title 'Thank You'. Your logo or text can be heat embossed. One off set up cost £35 up to 90 sq cm subject to sight of artwork. Padded Wave. Our new range of wooden bill holders combine functionality within a stylish slim size that is unique to this range. Choose from a range of four wood finishes - dark wood, natural wood, grey wood or white wood with a tough bonded leather spine in black or dark brown. Your customised logo, text or design can be blocked onto the front cover. Available in black, white, brown, gold, silver or copper. can be engraved with your own logo, text or design to reveal natural colour of wood (no infill) up to 90cm2. Our incredibly popular range of rustic style bill presenters. 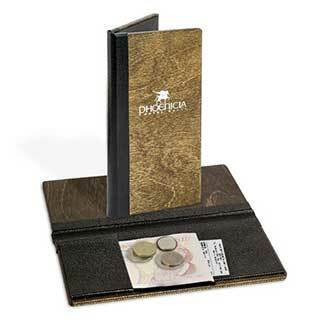 Unique and tactile each of these bill presenters can be supplied in a choice of four wood finishes and features an interior pocket to hold cards, bills and notes. 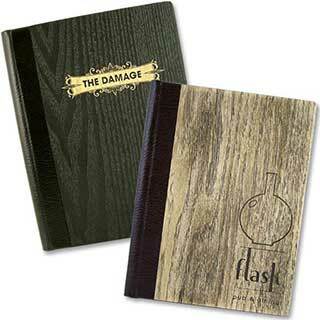 Choose from a range of four wood finishes - black, brown, red or white with a tough bonded leather spine in black or dark brown. 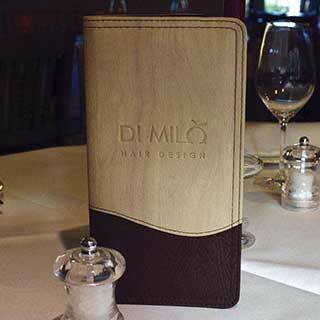 Bill holder cover can be engraved with your own logo, text or design up to 90cm2. One off set up from £30 (Subject to sight of artwork). Our incredibly popular range of Tarsus products is now available in a range of bill holders that are ready to be engraved with your own design. Choose from a range of seven contemporary colours in an aluminium finish that is strong and scratch resistant. Three styles of bill presenter. 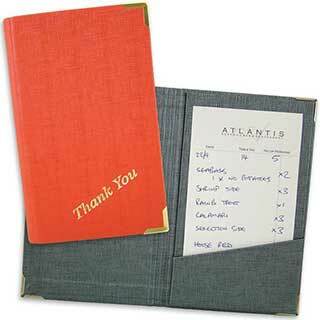 (1) Pocket style is side opening with small and large sizes and ideally suited for holding bills, notes and cards. 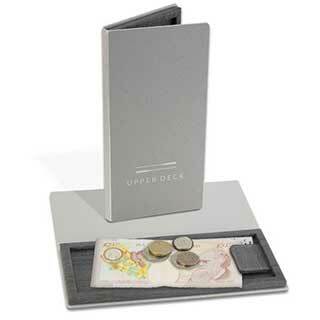 (2) The flip up style presenter utilises the same interior pocket while using a stylish top opening cover. (3) Our tray style uses an interior fixing that has a magnetic tab for holding bills, cards & notes while a raised border helps keep coins contained within the cover. Available in black, blue, brown, burgundy, graphite, green, silver and white. A new full colour tarsus design printed metal bill presenter available in 3 great styles with a flip tray, a pocket or a flip up cover. All styles feature our unique scratch resistant metal which has a slightly textured powder coating in silver or white. (1) Side opening pocket style is available in two sizes and features a bottom pocket to hold the bill in place. (2) Flip up style also features a bottom pocket for bills, receipts & cards but utlises a stylish and easy top opening cover. (3) Tray style uses an interior fixing that has a magnetic tab for holding bills, cards & notes while a raised border helps keep coins contained within the cover. Two different printing techniques are available for personalising. Our Canterbury bill presenter is manufactured from high quality faux leather but has an elegant look and a feel of smart classy leather. This bill presenter has the look and feel of fashionable leather and can be supplied in a wide range of modern colours. Colours available:- Aqua, Black, Burgundy, Camel, Dark Blue, Dark Brown, Grey, Ivory, Mocha, Pale Blue, Purple and Red. A contemporary woven fabric style bill presenter with a soft texture. Available in 14 colours, Autumn Orange, Beige, Black, Blush Pink, Bright Green, Camel, Dark Blue, Dark Brown, Deep Red, Graphite, Grey, Light Blue, Mushroom and Mustard. Black Silver or gold corners can be added at extra cost. With an interior pocket to hold notes, coins, cards, etc. Your logo, text or design can be foil blocked in various foil colours including Gold & Silver. One off set up cost £35. A Personalised metal plate cn be printed in full colour. Available in gold, silver or white. One off set up cost £30. 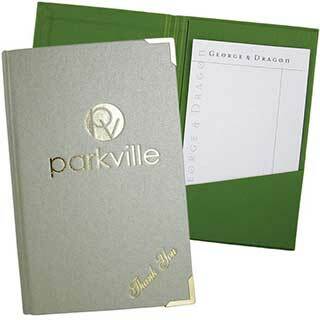 Our soft touch bill presenter is manufactured from a new synthetic fabric which has a rubber-like texture. 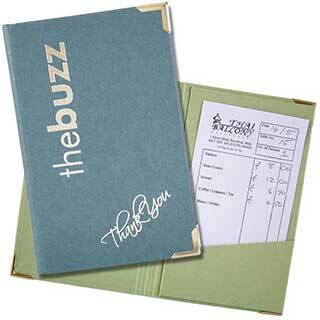 This bill presenter is part of our modern stylish range of soft feel folders. Supplied in five colours:- Black, Blue, Camel, Grey and Red. Your logo or text can be foil blocked or heat embossed. One off set up cost £35. Standard 'Thank You' (Free). Choose from many styles. Heat embossed or foil blocked in gold or silver. Your bill presenter will be supplied without personalisation.